Each Savas piece comes only by custom order and requires three personal fitting appointments before completion. Yarborough performs the work as an alchemist, selecting the hides and colors from her treasure chests that best suit each client, whether he’s dipping into a gold dust sunset, riding a dark lost highway, or wandering through a Moroccan blue souk. 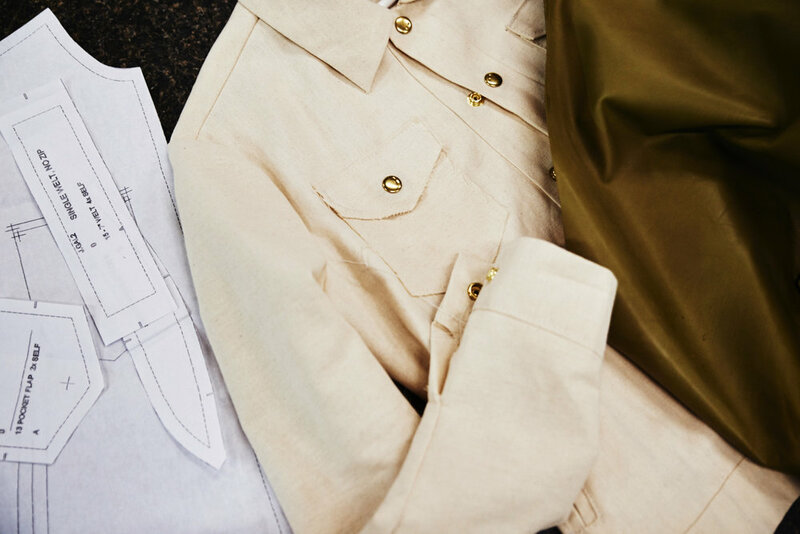 Collaboration on such bespoke pieces is essential—the work must breathe with the soul. Hidden pockets to hold ancient totems, metals placed like Arabian armor, and soft embroidery sewn like Persian tapestry set the edge. But it’s the cut of the sleeve, the seam along the torso, the tattoo hidden beneath the interior silk that best hint about what the wearer loves—or pursues. Everything is hand-cut and hand-sewn in studio over 70 hours of work. The millennia-old art of chain-stitch embroidery imbues each jacket with the final element of personal meaning. It’s the elusive detail on the interior that is known only to the wearer. From private sentiments to humorous memories, the client’s own desires are translated stitch by stitch in each jacket’s lining.